I remember, when I was ten years old, my parents separated. A year later – possibly earlier, I can’t really remember – I was introduced to my father’s new partner. I didn’t know what to do – hug her? Hit her? In the end I think I did neither, just nodded. I then spent the next decade trying to work out this tangled web around me – my father, his new partner, my mother. Breaking up, moving on, finding another, the blending of families, causes emotions to run high. Maybe no one should be surprised. What woman, who has given birth to a man’s children, wants to be usurped? Very few women are contented to back off, sit down and watch another woman enter in to her exes life and take over ‘mummying’ her children, especially with a gaggle of photographers round her. It must be utterly galling. 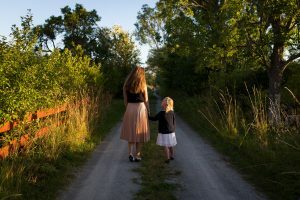 In my own experience, as well as being step-parented, I have also been a step-parent – a former partner of mine and father of my eldest son had a previous child. A few years ago I a single mother of four children, having separated from the father of my subsequent three children. I liked to think I will be able to cope when the inevitable eventually happens but, in all honesty, I am not convinced. Even though my relationship with my children is as about as strong as it could possibly be, the thought of my children calling someone else ‘mummy’ makes me breathless with fear and shock. I haven’t been through all this, all these pregnancies, this breast feeding, nappy changing, sleepless nights, potty training, parent-teacher meetings, doubt, elation, love, tears and endless worry, worry, worry just for someone else, some unknown woman, to breeze in bearing gifts, smiles and tauter thighs and stomach than me. I don’t want my children to have a ‘Mummy Two.’ To me, this is terrifying. When I voice my fears to my friends, they say, ‘but you will always be the children’s mother. Nothing will change that.’ In my heart, I know that. But the thought of seeing them holding another woman’s hand, sitting on her lap, being picked up from school at Hurley did to Warne’s youngest daughter this week with hugs all round, makes me feel physically sick. Then again, I also have to accept men too feel this way. Do they really want to see another man playing ‘dad’ to their kids? However, this is not always as easy as it sounds. I have a friend who married a man who has three sons. She also admits to feelings of intense jealousy and rage against his former wife. Psychotherapist Phillip Hodson says there is a very difficult power play that goes on between the new love and the ex-wife and mother. It’s a very tangled web. My own personal experience has, so far, been pretty positive. After a few teething problems, I got on well with my step-mother. I think – hope – I was a perfectly good step-parent of my ex-partner’s son. My style of step-parenting back then was to let father and son get on with their relationship while I quietly supported it from the sidelines. I hope that any new woman in my ex-partner’s life will take a similar attitude, be present, respectful, kind and do not encroach on mothering territory. Taking a child for a first haircut, as Sienna Miller did with one of Jude Law’s and Sadie Frost’s children, is red rag to a bull. Most people, I hope, are not that tactless.